Vitamin K-dependent proteins (VKDPs) require carboxylation to become biologically active. Although the coagulant factors are the most well-known VKDPs, there are many others with important physiologic roles. Matrix Gla Protein (MGP) and Growth Arrest Specific Gene 6 (Gas-6) are two particularly important VKDPs, and their roles in vascular biology are just beginning to be understood. Both function to protect the vasculature; MGP prevents vascular calcification and Gas-6 affects vascular smooth muscle cell apoptosis and movement. 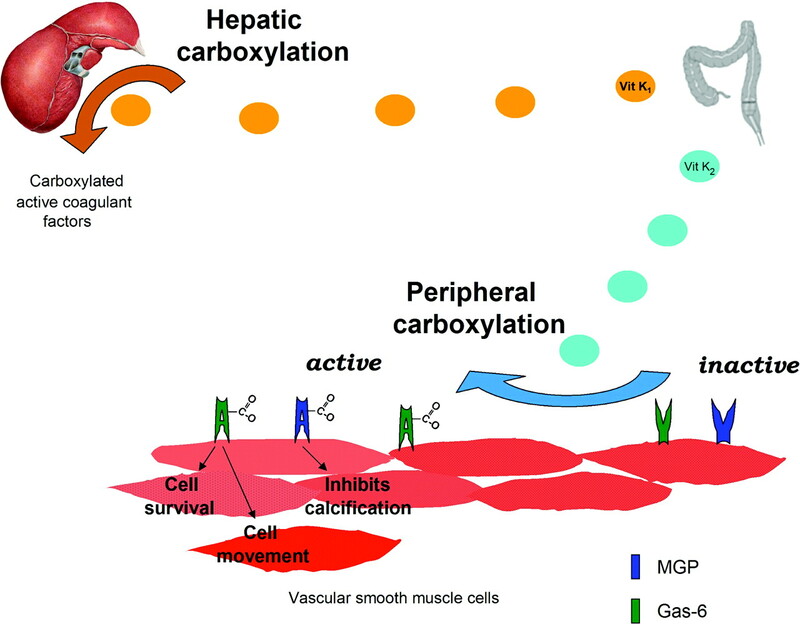 Unlike the coagulant factors, which undergo hepatic carboxylation, MGP and Gas-6 are carboxylated within the vasculature. This peripheral carboxylation process is distinct from hepatic carboxylation, yet both are inhibited by warfarin administration. 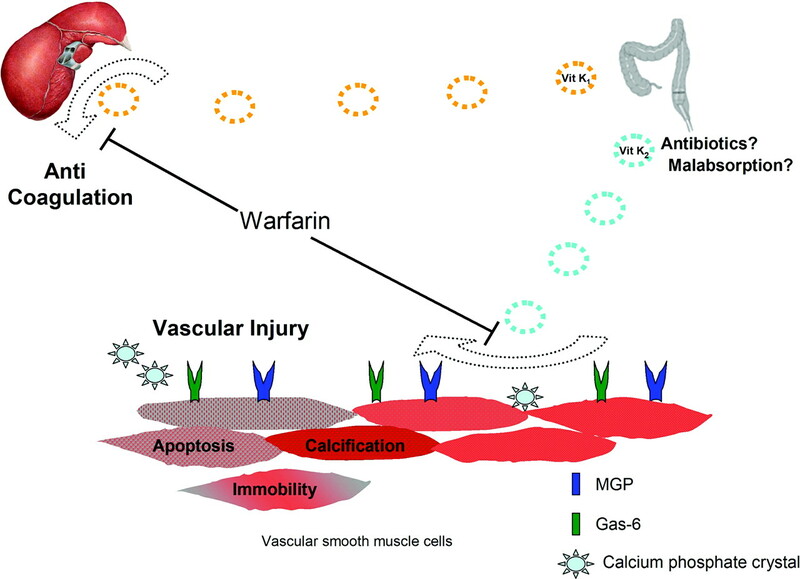 Warfarin prevents the activation of MGP and Gas-6, and in animals, induces vascular calcification. The relationship of warfarin to vascular calcification in humans is not fully known, yet observational data suggest an association. Given the high risk of vascular calcification in those patients with chronic kidney disease, the importance of understanding warfarin's effect on VKDPs is paramount. Furthermore, recognizing the importance of VKDPs in vascular biology will stimulate new areas of research and offer potential therapeutic interventions. The most well-known vitamin K-dependent proteins (VKDPs) are the coagulant factors II,VII, IX, and X. Produced by the liver, they are converted into their biologically active forms by the carboxylation of glutamic acid residues, a process requiring vitamin K as a cofactor. By interfering with this carboxylation process, warfarin has become the mainstay of anticoagulant therapy. However, beyond these coagulant factors, there are other VKDPs with widespread physiologic activities. Recent studies have focused on two particularly important VKDPs, Matrix Gla protein (MGP) and Growth Arrest Specific gene 6 (Gas-6) protein. These proteins have many diverse biologic functions, yet with the recognition that they are produced by vascular smooth muscle cells, their roles in vascular biology are being increasingly explored. MGP functions primarily as a vascular calcification inhibitor. Gas-6 affects vascular smooth muscle cell movement and apoptosis. Together, these proteins constitute a new mechanism of local vascular regulation, where the blood vessel defends itself against injury and participates in self-repair. A failure of these local mechanisms might be an important first step in a cascade of events culminating in vascular calcification, and supports the notion that vascular calcification is an active, regulated process. To become biologically active, both MGP and Gas-6 undergo carboxylation, a process that occurs at the blood vessel level. Like hepatic carboxylation, this peripheral carboxylation is inhibited by the administration of warfarin, yet whereas warfarin's anticoagulant effect is well known, its effect on the vasculature is less certain. Emerging in vitro and whole animal data suggest that warfarin may induce vascular calcification, a potential relationship that has not yet been well studied in humans. Given the widespread use of warfarin, understanding the full spectrum of its biologic effects is important. This article reviews the general physiology of VKDPs and explores a potential relationship between warfarin and vascular calcification in susceptible individuals. Produced by many cells types, and binding to one of three receptors (Tyro3, Axl, or Mertk), Gas-6 has widespread physiologic roles, important in inflammation, renal disease, sepsis, and neoplasia (1). Its role in vascular biology is complex, on one hand promoting thrombus formation, and on the other, protecting against vascular calcification. Gas-6 is secreted by platelets, contributing to platelet degranulation and aggregation. Gas-6-deficient mice seem to be protected from thromboemoblism (2), and human polymorphisms that lead to increased Gas-6 activity are associated with an increased risk of stroke (3). However, Gas-6 produced by vascular smooth muscle cells seems to have a different effect. By binding to its receptor Axl, it stimulates the anti-apoptotic protein Bcl-2 and inhibits the proapoptotic protein, caspase 3 (4), ultimately conferring a state of longevity to the cell. In settings of vascular injury, Gas-6 provides protection from cellular death (5). In addition, it regulates vascular smooth muscle cell chemotaxis and movement (6). Thus, although platelet-derived Gas-6 activity might be thrombogenic, Gas-6 produced by the vascular smooth muscle cells seems to have a protective role against vascular injury. Indeed, recent in vitro studies have shown Gas-6 prevents vascular calcification. In a model of phosphate-induced vascular calcification, Son et al. have shown that Gas-6 prevents vascular smooth muscle cell apoptosis and calcification in a dose-dependent manner (7). Elevated phosphate levels directly suppressed Gas-6 activity (8). These findings raise fascinating questions about the mechanisms of vascular calcification. As originally suggested by Proudfoot et al. (9), whose important work showed that vascular smooth muscle cells develop apoptotic bodies before calcium crystals, apoptosis may be the critical first step, with calcification as a secondary phenomenon of dying cells. Gas-6's role in apoptosis and cell movement might provide a mechanistic explanation to this earlier observation. MGP also has important functions in vascular biology. An 84-amino acid protein, it is produced in bone and vascular smooth muscle cells and prevents vascular calcification. Its clinical importance is evidenced by the development of widespread and extensive vascular calcification in MGP knockout mice, which is prevented if arterial MGP expression is genetically restored (10). In humans, a rare genetic disorder resulting from mutations in the MGP gene, Keutel syndrome, is associated with extensive soft tissue calcification and vascular calcification (11). In postmortem evaluation, calcium deposition is primarily located within the media of the vessel wall, specifically the elastic interna, with little intimal involvement. The potential role of MGP polymorphisms in vascular calcification is not fully known yet raises interesting questions about genetic susceptibility to vascular calcification (12). Despite the clinical importance of MGP in preventing vascular calcification, its exact mechanism of action remains unknown. MGP complexes with ambient calcium, preventing calcium supersaturation and crystallization within vessel walls (13), and by binding to hydroxyapatite crystals, inhibits their crystalline growth. MGP also inhibits vascular smooth muscle cells from dedifferentiating into osteoblast-like cells, a well-established mechanism for vascular calcification (14). Recent studies suggest that the activity of MGP is affected by bone morphogenic protein-2 (BMP-2) (14). These observations about the role of Gas-6 and MGP have not been confirmed in human studies. The complexity of their biologic mechanisms remains, with conflicting and uncertain conclusions within the literature. However, emerging data have recently shown an important new component of the biologic activity of these proteins. Namely, as part of the VKDP family, both must be converted to their functional forms by undergoing carboxylation. Thus, in addition to the expression of these proteins, the structural form determines functional activity. This emerging recognition might partly explain a discrepancy in the literature, with some suggesting serum levels correlate with protein activity and others finding no relationship (15). Ultimately, although serum levels have been studied in various conditions, little is known about how to assess for functional protein activity. This process of VKDP activation is reviewed next. The process of converting VKDPs to their biologically active forms requires the carboxylation of glutamic acid residues, a complex and incompletely understood process involving multiple enzymes (16). As a final step, γ-glutamyl carboxylase (GGC) facilitates the addition of a CO2 molecule to the γ-carbon of glutamic acid, forming γ-carboxyglutamic acid. This requires the presence of the reduced form of vitamin K. Because vitamin K naturally occurs in the oxidized form, it must be converted into a reduced form, a reaction catalyzed by vitamin K epoxide reductase (VKOR). In this process of carboxylation, vitamin K is returned to its oxidized state, and a cycle of vitamin K reuse ensues. Warfarin, which shares a common ring structure with vitamin K, interferes with VKOR, interrupts vitamin K recycling, prevents further γ-carboxylation, and ultimately leads to a deficiency of active VKDPs. In addition to VKOR and GGC, several other enzymes play critical roles in this process. Calumenin, a recently discovered protein, interferes with VKOR and also prevents vitamin K recycling (17). Cytochrome P4502C9 (CYP2C9) is responsible for the metabolism of warfarin. Ultimately, the complexity of the carboxylation process, with multiple enzymatic reactions and many polymorphisms of participating gene products, leads to a wide range of VKDP phenotypes and partly explains the variation in individual susceptibility to warfarin. Although carboxylation is common to all VKDPs, the process of producing and subsequently activating VKDPs can be quite varied. As seen in Figure 1, the coagulant factors are produced and carboxylated within the liver. However, MGP and Gas-6 are produced within the vascular smooth muscle cell and undergo local carboxylation. Important studies by Murshed et al. (10) have shown that, although the liver makes MGP, such hepatic production does not protect against vascular calcification; rather, the protein must be locally produced within the vasculature. This tissue localization might explain why serum levels of MGP do not correlate with its biologic activity (18). Hepatic and peripheral carboxylation of VKDPs. Vitamin K-dependent proteins undergo carboxylation to become biologically active, requiring vitamin K as a cofactor in the conversion. In hepatic carboxylation, the liver uses vitamin K1 to activate the coagulation factors. In a distinct process, vascular smooth muscle cells produce and activate MGP and Gas-6, two proteins with important roles in vascular biology, affecting cell movement, survival, and calcification. This peripheral carboxylation primarily depends on a family of menaquinones, collectively known as vitamin K2, which differ in structure and metabolism from vitamin K1. Vitamin K1 predominantly is derived from the diet. Vitamin K2 comes either from enterocyte conversion of vitamin K1 or from indigenous intestinal bacteria production. In addition, the process of carboxylation differs between the liver and the periphery. The activity of VKOR, the enzyme responsible for vitamin K recycling, is three times higher in vascular smooth muscle cells than in the liver (19), suggesting that peripheral carboxylation may be more dependent on adequate stores of vitamin K. In addition, although the liver seems to predominantly use plant-synthesized phylloquinones, vitamin K1, peripheral carboxylation is more dependent on the menaquinones, a structurally distinct group collectively known as vitamin K2 (20,21). Unlike vitamin K1, there is little vitamin K2 in western diet, and its source remains controversial. Initial theories suggested that vitamin K1 was converted into vitamin K2 by indigenous intestinal bacteria, with subsequent absorption (22), yet more recent studies suggest that this structural transformation actually occurs independently of bacteria within the intestinal enterocyte (23). Although the exact pathway of vitamin K2 entry into the body is uncertain, it does seem to accumulate preferentially in peripheral tissues (24), with particularly high levels in brain, aorta, pancreas, and fat, and low levels in the liver (25). Transport mechanisms may partly explain this difference in tissue concentration (26). Although both are absorbed from the small ileum and jejunum, vitamin K1 is incorporated into triacylglycerol rich lipoproteins and delivered to the liver, whereas vitamin K2 is transported via Low-density lipoprotein and High-density lipoprotein particles to other organs (27). Both whole animal and clinical studies support the notion that hepatic and peripheral carboxylation has unique vitamin K dependence. Vitamin K2 supplementation prevents arterial calcification, yet vitamin K1 does not (28). Conversely, the administration of vitamin K1 allows for normal coagulation production, yet does not prevent peripheral vascular calcification (29). In the Rotterdam study, a large epidemiologic trial investigating the relationship of nutritional intake to cardiovascular disease, vitamin K2 intake was inversely related to both vascular calcification and mortality (30), whereas vitamin K1 intake seemed to have no relationship, a finding noted by others (31). These studies suggest that vitamin K2-dependent peripheral carboxylation protects the vasculature from calcification and raises important questions about the bioavailablity of vitamin K2. Prolonged antibiotic use (22) and malabsorptive syndromes (32) have been associated with vitamin K2 deficiency, possibly by interfering with enterocyte or intestinal bacterial conversion of vitamin K1, and vascular calcification syndromes have been reported in such settings (33,34). Schurgers et al. have illuminated the critical importance of post-translational carboxylation of peripheral VKDPs (35). Although both normal and calcified vessels express MGP, normal vessels have a predominance of carboxylated MGP, whereas calcified vessels have a predominance of the uncarboxylated version (35). It seems that the ratio of carboxylated to uncarboxylated protein ultimately determines biologic activity of both MGP and Gas-6 (36). These findings suggest a potential mechanism. To help protect blood vessels from injury, vascular smooth muscle cells continuously produce MGP and Gas-6, which then undergo carboxylation. The carboyxlated proteins form a defense against injury: MGP preventing crystalline supersaturation and Gas-6 regulating both apoptosis and migration of smooth muscle cells into areas of injury. As illustrated in Figure 2, failure to activate these proteins leads to vascular injury. Whereas nutritional deficiency of vitamin K1 affects hepatic carboxylation, vitamin K2 deficiency predominantly affects peripheral carboxylation. Warfarin affects both pathways. By blocking hepatic carboxylation, it causes anticoagulation, and by interrupting peripheral carboxylation, it potentially may lead to vascular injury. Much is still unknown about the peripheral pathway of VKDP carboxylation, and more research is warranted. Because warfarin is already widely in use, however, its potential relationship to vascular calcification warrants further review. Warfarin inhibits hepatic and peripheral carboxylation. Warfarin prevents vitamin K from participating in the carboxylation process, inhibiting both hepatic and peripheral production of VKDPs. The well-known therapeutic effect is anticoagulation. However, warfarin also inhibits activation of MGP and Gas-6, interrupting the protective mechanisms of these proteins. Vascular smooth muscle cells are unable to respond to injury in a normal manner, and potentially, cell death and eventual calcification ensue. Deficiency of vitamin K2, resulting from either vitamin K1 nutritional deficiency, malabsorptive states, or alteration of indigenous intestinal flora, may potentially lead to vascular injury. Used widely in atrial fibrillation, stroke, and hypercoagulable disorders, warfarin has gained widespread popularity for its anticoagulant effects. By blocking VKDP γ-carboxylation within the liver, it prevents the hepatic formation of clotting factors. However, warfarin affects peripheral carboxylation as well, interfering with the peripheral production of VKDPs. Osteocalcin, a VKDP important in skeletal health (and not further reviewed here) is inhibited by warfarin, and animals placed on warfarin therapy develop osteopenia within months (37). In vitro experiments have shown that warfarin inhibits both Gas-6 (38) and MGP (39) carboxylation. In whole animal studies, Price et al. have shown that warfarin induces widespread vascular calcification in rats (40). In this model, the combination of warfarin and vitamin D-induced hyperposphatemia caused massive vascular calcification in young, but not mature, animals. This calcification predominantly involves the elastic lamellae of the media with intimal sparing, similar to that seen in MGP deficiency. The relative contributions of warfarin, vitamin D, phosphate, and age to the calcification process remains unknown, yet given the widespread use of vitamin D analogues and warfarin, raise issues of potential drug effect. The distribution of vascular involvement in warfarin-treated animals seems to favor medium-sized vessels, with relative sparing of capillaries and veins (29). This raises questions about whether certain vascular beds are more susceptible to vascular calcification and whether the expression of VKDPs might vary within the vasculature. In at least in vitro experiments and whole young animals administered vitamin D, warfarin seems to worsen vascular calcification. This relationship has not been studied in humans. Although warfarin has been widely investigated in the cardiovascular literature, particularly in its relationship to arterial bypass graft patency, most trials have relied on angiographic evaluation of lumen patency. Because vascular calcification is frequently limited to the media, without affecting the lumen, it remains difficult to make definitive conclusions. However, a small computed tomography study found that warfarin use was associated with both valvular and coronary calcification (41). Histopathologic examination of aortic valves replaced for aortic stenosis found that those patients treated with warfarin had a two-fold increase in valvular calcification (42). Warfarin initiation has also been associated with calcemic uremic arteriopathy (43), a systemic vascular calcification syndrome typically involving small capillaries. Ultimately, without well-done studies focusing on the quantification of vascular calcification, no conclusions about warfarin's effect on vascular calcification can be made. Clearly, these observational studies can do no more than suggest association, but the potential relationship at least warrants larger prospective studies to better evaluate the relationship between warfarin and vascular calcification. Any suggestion that warfarin might be associated with vascular calcification raises the question as to why so many people, when placed on warfarin, do not develop vascular calcification. Perhaps the complexity of the vitamin K-dependent carboxylation process might explain why some patients may be at higher risk for the development of associated vascular calcification. Genetic variation in the carboxylation enzymes has been shown to explain individual sensitivity to the anticoagulant effect of warfarin. Polymorphisms in the VKOR gene, cytochrome P4502C9 (CYP2C9) (44), and calumenin (45) all have been showed to modulate warfarin's anticoagulant effect. Recent data suggest that this genetic variation might be associated with warfarin's vascular effects as well. Certain polymorphisms of VKORC1 have been associated with stroke and aortic dissection (46). This association between certain genetic polymorphisms and vascular disease suggests that, as certain individuals are more sensitive to the anticoagulant effect of warfarin, they may be more at risk for the vascular calcification tendencies as well. Given the complexity of the carboxylation process and the notable differences between hepatic and peripheral carboxylation, it seems plausible that warfarin might affect the vitamin K-dependent mechanisms in the liver and blood vessels in different ways. Indeed, recent data show that low doses of warfarin inhibit peripheral carboxylation without affecting hepatic carboxylation (47), suggesting that vascular VKDPs may be more sensitive to warfarin than the hepatically produced clotting factors. Ultimately, these observations raise questions about whether the risk of vascular calcification should be added to the risk of bleeding when considering whether to initiate certain patients on warfarin. Interestingly, patients anticoagulated for peripheral vascular disease had an almost 10 times higher risk of bleeding than those anticoagulated for other reasons (48). It is intriguing to wonder whether certain patients have global underactivity of their carboxylation processes, such as those with undetected vitamin K deficiency, and if such patients develop premature vascular disease and/or higher rates of bleeding complications when placed on warfarin. Although this is purely speculative at this point, it raises interesting questions about whether there might be certain identifiable populations that are particularly at risk to develop bleeding and vascular calcification when placed on warfarin. Emerging data suggest that the end-stage renal disease (ESRD) population, a group already plagued by vascular calcification, may be one such group. Given the high coincidence of atrial fibrillation and ESRD, the use of warfarin in thromboembolic disorders, and consideration of warfarin administration for arteriovenous graft survival, many clinicians will be challenged with the question of whether to use warfarin in dialysis patients. Although warfarin use has clearly been shown to reduce thromboembolic events in the general population, these studies excluded renal failure patients, and the applicability of these findings to the ESRD cohort is uncertain. Given the multiple additional risk factors for hemorrhage, including aspirin use, heparin anticoagulation during dialysis treatments, increased presence of gastrointestinal arterial venous malformations, and platelet dysfunction of uremia, ESRD patients are at particular risk for hemorrhagic events. In addition, the incidence of stroke in the general ESRD populations is almost 10 times higher than that of the general population, related to mechanisms distinct from atrial fibrillation, such as vascular calcification and hypertension (49). Thus whether anticoagulation can alter such a stroke risk, without an associated marked increased risk of bleeding, remains uncertain. Several retrospective analyses of ESRD patients highlight the dissimilar risk profile in ESRD from that of the general population, and suggest that the risk of anticoagulation-induced bleeding may outweigh potential reductions of thromboembolic stroke (50). Whether warfarin use worsens vascular calcification in ESRD is uncertain. A recent small retrospective cohort trial has suggested that long-term use of warfarin is associated with severity of aortic valve calcification in hemodialysis patients (51). In addition, the ESRD cohort has several particular characteristics that might contribute to their overall sensitivity to warfarin use. Booth et al. have recently shown that subclinical vitamin K deficiency, defined as having normal coagulation studies but a phylloquinone concentration less that 0.4 nmol/L, was present in almost 30% of dialysis patients (52). The combination of vitamin K deficiency, phosphate elevation, and vitamin D use might cumulatively add to the potential vascular toxicity of warfarin. In addition, dialysis patients may have a different distribution of MGP polymorphism than the general population, raising further possibilities of differential effects of warfarin in this population (53). Furthermore, dialysis patients have different levels of MGP than healthy controls (54), suggesting that the expression of VKDPs might be affected by the milieu of ESRD. Clearly, more studies are needed to evaluate the relationship of warfarin, VKDPs, and vascular calcification in the ESRD cohort. Although initially considered a passive process resulting from supraphysiologic concentrations of serum phosphate and calcium, vascular calcification has been shown to be actively regulated and biologically complex (55,56). VKDPs add another dimension to this process. Produced and activated at the level of the vascular smooth muscle cell, Gas-6, and MGP provide local protective mechanisms, influencing cell death, movement, and calcification, and support the notion that the blood vessels themselves actively participate in their own defense. Polymorphisms within the peripheral carboxylation process might explain why some patients are more at risk for calcification than others. In addition, site specific enzyme activity and vitamin K requirements might explain why certain blood vessels seem to calcify, with diabetes typically involving larger vessels, whereas calcemic uremic arteriopathy classically involves smaller vessels. Further research into this area could have important therapeutic consequences. Genetic profiling could identify those individuals particularly at risk for vascular calcification. Vitamin K2 supplementation to those who require warfarin may provide a novel method to protect the vasculature while allowing anticoagulation. Assessing vitamin K2 levels in ESRD might reveal unrecognized deficiencies that, if corrected, might ameliorate cardiovascular disease. Ultimately, deciphering the exact relationship of warfarin to vascular calcification will require further clinical investigation. Analysis of the patient populations included in prior imaging studies might be the first step in assessing whether those on warfarin develop worsening calcification. More detailed analysis of expression and activation of VKDPs in warfarin-treated patients would provide useful information about potential mechanisms of vascular disease. Such studies are important and ultimately might influence decisions regarding the risks of warfarin, particularly in those patients at high risk for vascular calcification. Without that data, any conclusions about warfarin's effect on vascular calcification in humans remain premature. In addition, even if such a relationship does exist, the risk of vascular calcification might still be outweighed by the risk of no anticoagulation. Until other oral anticoagulants have gained widespread use, this would remain a difficult decision. As of this point, much remains unknown about this field, and although emerging in vitro and whole animal data suggest that warfarin may effect vascular calcification, more research on this topic will be required to provide definitive answers. The author thanks Drs. Stewart Lecker and Marc Cohen for their critical review of this manuscript and Judi Hansjon for editorial assistance. Vitamin K, an example of triage theory: is micronutrient inadequacy linked to diseases of aging?